1952 - The idea and the need for the development of the Birthplace Shrine was discussed and advanced. 1953 - The General Assembly appointed the Birthplace Shrine Committee. On that committee were Mr. Joe M. Forbis, Mr. Paul Hampton, The Reverend Mr. W. T. Ingram, Sr., Mr. Chester Parham, and Mr. John B. Talley. Other members serving on the Birthplace Shrine Committee included Mr. J. Frank Hobbs and Mr. Albert McDonald. The committee was later reduced to three members and Mr. Joe M. Forbis and Mr. Chester Parham have served continuously. 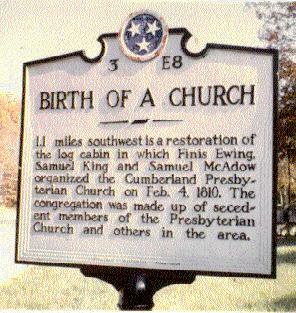 On November 10, 1953, the Trustees of Clarksville Presbytery, formerly Charlotte Presbytery, now part of Nashville Presbytery, delivered the General Warranty Deed to the 5 1/2 acres of land of the Birthplace Shrine to the Board of Finance, now the Board of Stewardship, Foundation and Benefits, of the Cumberland Presbyterian Church, Inc.
1956 - The McAdow house, a reproduction of the home of the Reverend Mr. Samuel McAdow was constructed. The house was designed by Mr. Wells Awsumb. 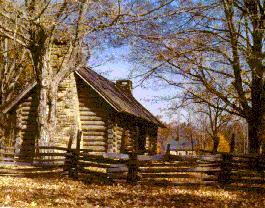 1957 - On February 3, 1957, 103 members of the Cumberland Presbyterian Church met at the log house and around fires in both fireplaces had fellowship and worship. 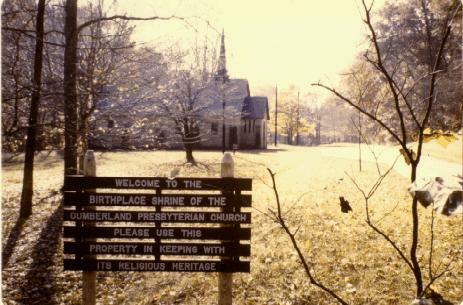 1958 - The General Assembly of the Cumberland Presbyterian Church authorized $25,000 for a Chapel at the Birthplace Shrine in the Mid-Century Advance Program. 1960 - The 150th Meeting of the General Assembly of the Cumberland Presbyterian Church, meeting in Nashville, had a special service and dedication at the Birthplace Shrine. The Chapel was completed for the dedication. 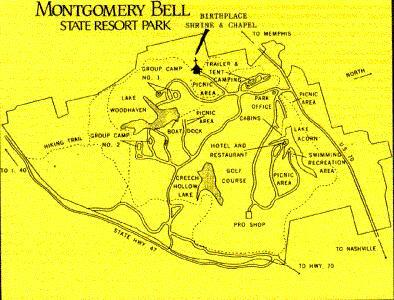 1961 - The Board of Missions employed a chaplain to serve in the park and to conduct a worship service at the Birthplace Shrine during the months of June, July and August. 1965 - On October 22 the Board of Finance received $500 for the establishment of the Birthplace Shrine Fund. 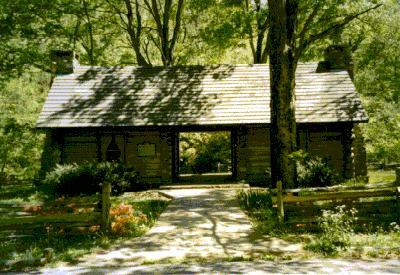 2010 - The 180th Meeting of the General Assembly of the Cumberland Presbyterian Church, meeting in Dickson, had a special service at the Birthplace Shrine to celebrate the 200th Anniversary of the Founding of the Cumberland Presbyterian Church. 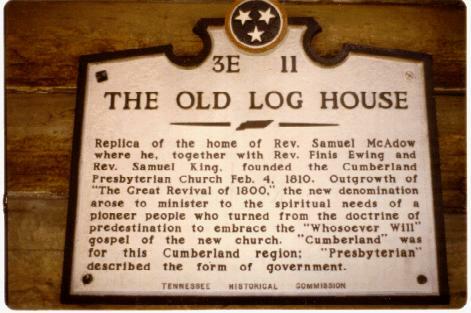 The two monuments, containing each congregation's name in the Cumberland Presbyterian Church and the Cumberland Presbyterian Church in America, were dedicated on June 15, 2010. Members of both denominations attended this special service.